Last night was one of those "white nights" where I slept badly and ended up rising at 2:30 am. I desultorily worked on my laptop and watched some YouTube videos to pass the time. My computer is located in the kitchen, which was lit only by one low-wattage lamp. 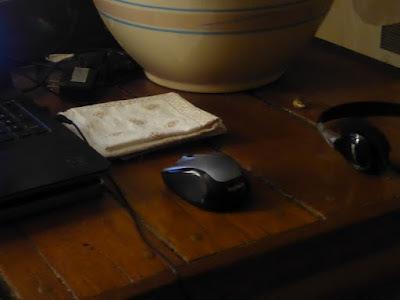 Next to my computer was the usual clutter of a home office, including a blob of thread or lint that had somehow made its way there. 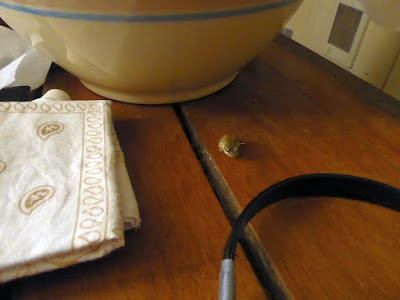 But as the morning crept in and the light increased -- and I decided to take the blob of lint and toss it in the trash -- I made an interesting discovery: I was being watched. Yes, for hours this little guy had fearlessly sat inches away from my laptop, calmly watching me at work. I tell ya, never a moment of privacy. I scooped him up and put him outside. 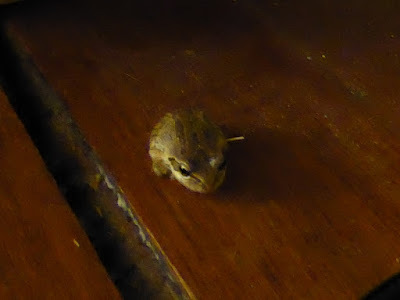 A few hours later, I found another little frog under the piano, and I also got him outside. Suddenly we have little frogs everywhere. This is why we ended up having a frog in our canning closet all last winter -- they're often hard to find. Is this normal? lol seems vaguely plague-ish. Cute little guy though. Better than mice or roaches! Cute little guy. And so attentive! One time years ago I discovered a teeny frog like that sitting on the edge of my aquarium in the kitchen. They are so cute! Your columns have attracted the attention of Big Brother. Me thinks your home has been bugged, err... rather, frogged.